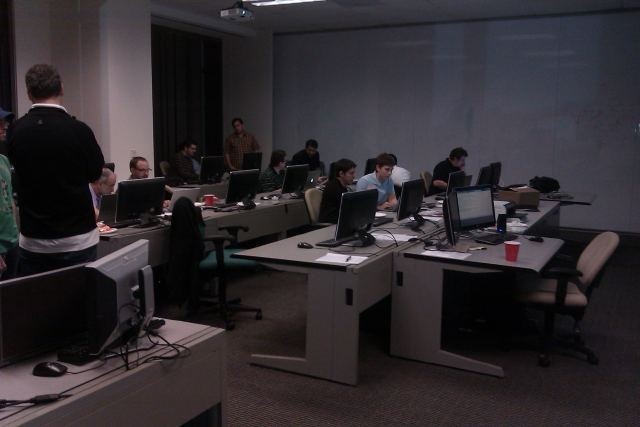 I’ve never seen a turnout at Dallas Hack Club like this past Tuesday night. What an awesome & diverse group of developers. Pairing languages included Ruby & C#, and even an F# & a (first time at Hack club) SmallTalk pairing. As fascinating as Hack Club Meetings always are, the different languages made the demos even more fascinating (after coding for a couple of hours, each pair demos their approach/solution). One demo was done in a SmallTalk IDE (because, as we learned, Smalltalk doesn’t lend itself to pasting code into Gist or Pastebin for the demos, like the other languages). Although I’ve heard Smalltalk mentioned in reference to someone’s programming past, or citing parts of its historical influences, I’d never seen Smalltalk syntax or the Smalltalk IDE before. Super-interesting. I have a “What’s this Ruby thing all about” itch I’m trying to scratch, but I clearly could not even think about pairing in it at this stage, so when I arrived, I asked Greg Vaughn if I could play 3rd wheel & watch him pair while I tried to wrap my head around it. Wow, that was a REALLY hard question to say out loud. This clueless person I’m projecting is NOT a persona in my comfort zone. 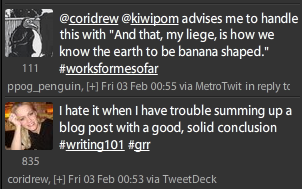 So we floundered through that for a few minutes before someone recommended the 30-day trial of RubyMine by JetBrains. So I installed RubyMine, went to the HackClub dropbox & opened Greg’s “rover.rb” file. During this time, I asked Greg many questions to get my head around all of it. My echoey thoughts: “Ok, it’s done. I’ll try the ‘rspec rover.rb’ command again.”. I then listened to some Ruby devs discussing one of their real-world problems at work that had to do with the best way to parse an xml file or a dom in Ruby. We all have those questions. Yay. 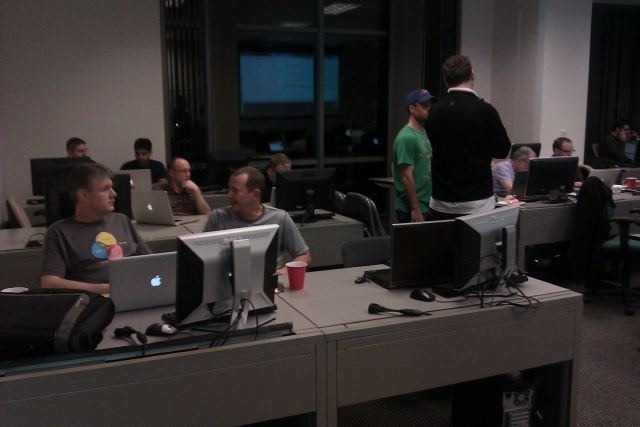 The great responses on my previous post made me take a harder look at the many, many Macs in the room. I think all but Greg’s were actually running Windows. I had no idea. Working through the initial, intimidating Ruby install with people around me who could help guide me through enabled me to feel like now I actually could run Matt’s sample with the comment instructions pasted above. Progress! Someone I haven’t talked about is Greg’s Ruby pairing partner, Richard. (All I know about him is his first name because he’s not on Twitter =P) His story was quite interesting. The reason he got into programming Ruby was to become a better software tester. Wow! I’ve known testers who learned a bit of SQL for DB testing, but never any who learned a programming language for software testing. That kind of blew my mind, to be honest. It made me really think about the people I love to work with the most. Then it made me think of people I’ve enjoyed working with the least, and remembered a Business Analyst I used to have to pull data for ALL THE TIME because she refused to learn anything other than Excel (“if they’re not paying for it, I’m not learning it” – seriously? Even if it can make your life better & you can stop making others write queries & create exports for you? Sigh.). She’s the reason I learned in ~2002 there was a 65,000 row limit in a single Excel Worksheet. No one should have to know there’s a 65,000 row limit in Excel. Mad props to Richard for stretching so far beyond just learning standard QA tools to the extent that he’s actually attending Dallas Hack Club to practice Ruby & do code katas. How inspiring & very cool. Tonight (Thursday after the Tuesday Hack Club meeting), I was able to attend David O’Hara’s talk on Git at Dallas C# SIG, and I have to say, it was very compelling. He did an excellent job of thoroughly explaining Git fundamentals & concepts. Fortunately, Shawn Weisfeld was there taping it, so I’ll update this post with a link to David’s talk when it’s posted to UserGroup.TV. Watching how fast David FLEW through that console was impressive, but his enthusiasm for Git was inspiring. Watching someone who’s as great at public speaking as David is always fun, but seeing great speakers talk about a topic they’re passionate about is a pure joy. He seriously LOVES Git. I can honestly say I’m starting to feel less… I don’t know if intimidated is the right word… much less repulsed by command line after this week’s meetings than I ever have before. When I got home, I then got into a discussion with my husband about how he felt the same way about command line years ago, until he had to learn Unix for his job & even his eyes lit up talking about how much he just loves it & feels at home in it. Different people learn in different ways. There’s nothing I love more than to be surrounded by people who know more than I know. The exposure to amazing, diverse & knowledgeable people who are so very helpful that the tech community makes available is incredible. Learning that it’s ok not to know everything is powerful. Discovering the support in the Tech Community for those who try is motivating. Although I’m sure it would take me working in these technologies for my job to become prolific, I’m surprised at how fast I *am* warming up to & feeling comfortable with these areas that I’ve avoided for so long. In a few hours, I went from, “whoa no way” to “I could / I can.” Who knew Embracing the Uncomfortable could be so interesting, fun, AND rewarding? But for now, I will put my full, swollen brain to sleep. It needs to digest this stuff & prepare for more. Nice article. I get the same tension between the ‘make me feel like an idiot for not knowing I needed to type “cat ‘-L -rXz’ >bar/.baz”‘ barriers and the ‘wow, well now I’ve got it working, look at me, ma!’ feeling when you crest the last hill and the vista finally unfolds before you. ‘Embracing the uncomfortable’ is a great way to put it. I just did a summer school in comics: it was uncomfortable for me because I can’t draw, but I was put in a situation where I had to anyway, and it was so liberating. Drawing is still uncomfortable for me, but it’s a discomfort I now enjoy embracing, and that’s a tremendously enriching feeling. Without the summer school I would never have overcome that barrier. How interesting that you came from UI design. I’d love to learn more about your journey into programming if you’ve blogged or spoken about it. I find those stories so very interesting. (If you haven’t heard it, Ivan Towlson, @ppog_penguin, lives in New Zealand & worked on Web Workbench, an extension that integrates Less, Sass & CoffeeScript into Visual Studio. To improve performance with syntax highlighting & Intellisense in real time, they wrote their own parser / highlighting engine using F# because of power of ASTs (abstract syntax trees). The pedant in me wants to correct a couple of minor things, but I won’t :-) They don’t detract from your honest writing showing your enthusiasm and trepidations. Thanks for sharing. Please, by all means, correct me. I recently heard someone say “look for a mentor no more than one or two levels above you because they remember where you are.” I found that to be very interesting advice (although clearly, I don’t follow it :-P) because I am horribly guilty of assuming that once I’ve crossed an understanding threshold, somehow everyone else understands everything I now grok, no matter how hard I might have found a concept at the time. I am hoping to look back on my posts in the near future & laugh because I will understand these languages and concepts so much better than I do now. You’ve got a great attitude. I learned long ago that one of the hardest, but most empowering things to say is “I don’t know, would you explain or show me?” Ignorance and stupidity are vastly different, and anyone who doesn’t realize that is stupid. rspec -f d is not “full debug”. It’s actually a shorthand for –format documentation. Very minor point. I was also going to have fun with the 65,000 row limit of Excel. It’s actually 64K, right? While I don’t dispute that I may have been the only Hack Club attendee running Mac OS X, the ratio would have been reversed in other contexts, such as Dallas Ruby Brigade. There it is likely that anyone without Mac hardware is probably running Linux on it. Ruby on Windows is still quite niche, but it’s a growing one and a great way to reduce the barriers to entry for Windows developers.